Tip: This article contains the best ad copy writing tips that'll get your business-for-sale advert maximum visibility and compel buyers & investors to respond. Nobody cares about your awards! Not at this stage anyway. If the #1 thing you can say about your business is that it's won awards, the chances are that you are not profitable! And profits are what buyers and investors are after. So put your ego aside, don't boast about what's important to you, even if you're really, really proud of those awards. Talk about what's important to the buyer! The potential is so good that this ad from KBS / Knightsbridge (one of the UK's largest business brokers) mentions it twice. If you want to attract buyers you talk about what the business currently has - what has been built so far - not what a buyer can do with it. Ad copy doesn't get more naff than "Unlimited growth potential". You could claim "unlimited potential" for any business under the sun. There was once a domain, google.com, available for $5. It had unlimited potential. Why didn't the domain sell for billions of dollars? Because potential is not where the value lies! Value lies in cash flow, in existing assets, in goodwill, in experienced staff ... that sort of thing. Not in some fairy tale about what could, maybe, possibly, sorta happen in the future (with the right type of owners and the right headwind). Buyers are smarter than you think. They are interested in net profit / take home profit. I know, I know, gross profit is a bigger number but all it says about your business, especially in this case where net profit is not disclosed, is that you're not really making a profit and that this is a business not worth buying. This one, from another big and well known business broker, Intelligent Business Transfer, discloses net profit, but it's minuscule next to the turnover. Net profit is less than 2%. The message to buyers is that this business is likely insolvent. If the most the business could do when preparing their accounts prior to sale was demonstrate a 1.8% profit then the business is a disaster, it's possibly one mistake away from complete collapse and the owners desperately want to get out quickly and let someone else face the music. And they'd like you to pay for the privilege by giving them money to take this mess over! KBS again! With turnover this small, this ain't a business, it's a job. Investors don't want to buy jobs. This screams "one man band". Loyal client base screams clients are "loyal to this one man who's going to be leaving the business when you buy it". Lots of fancy pictures of this gym's premises. And a number drop of turnover. But no mention anywhere in the ad about profit. Turnover is vanity, profit is sanity. Have I mentioned that buyers like to see profit, net profit? If that's the #1 thing buyers are looking for why would you avoid mentioning it (unless you're running at a loss)? There's a reason why ads like this one get a very, very low (to zero) response. Its value is based on goodwill towards the one person running this show. I figure it's one person given the turnover is just £42K. And this person wants to leave? This ad wasn't posted by a business broker getting paid for his "expertise", it seems to have been posted by the business owner, so maybe we should cut him/her some slack. This snapshot was taken on Aug 19th. Google's cache shows that this text existed on this ad page way back on the 13th of July (and possibly before that). If you don't have information to post about the business, then don't post the ad in the first place. Why? Because buyers want to see new ads. Those who are filtering ads and tweaking their search parameters based on age are going to see this ad in the first few days and ignore it because it lacks detail. Later on when they are filtering based on age again this ad is simply not going to feature on their radar because it is now an old ad. You lose ... and then you lose again. 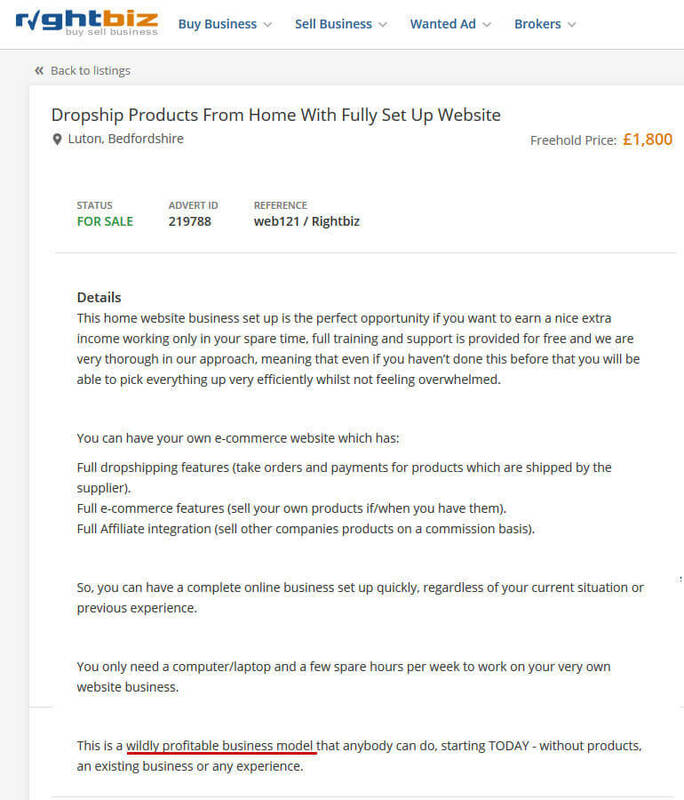 With a turnover of just £5K this can hardly be called profitable! Once the owner is paid a salary there's probably zero profit left. Further, being number one on Google is not a plus, it's a negative! It suggests the business is highly reliant on "free" traffic and could lose all of the tiny, tiny turnover the next time Google revises its algorithm (which Google does on a regular basis). What vendors often thinking is a great selling point is actually something that's working against them! This ain't a business, it's screams Get Rich Quick scheme. Terms like "wildly profitable" don't impress people. Tell the story well, don't pitch the hard sell, this isn't like flogging a used car. The fact that the seller claims it's a "freehold" business, when it's obviously not, says a lot about their complete lack of business nous. Would you buy a business from someone who doesn't know the first thing about business? And here's a gem from another business broker, Transworld. The turnover and net profit figures are exactly the same. ​Welcome to the world's only hair salon that pays no rent, no rates, no utilities and has staff all working for free! ​Tip 1: Give buyers what the buyers are looking for not what you think they are looking for! And what are buyers really looking for? We cover that here. Be honest. Disclose your net profit figures. If your net profit figures are low or embarrassing? You should still publish them. Don't try to tempt buyers in and then give them some story to explain the lack of profit. You'll just end up wasting their time ... and yours! 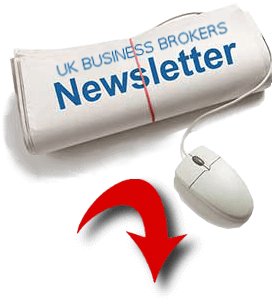 There are buyers who are looking specifically for low profit businesses / distressed businesses. They'll pay you less, but you're far, far better off being honest with yourself and targeting them instead (if you don't have the net profit figures to impress people)! ​Tip 2: ​Read this page again about how to impress investors and buyers. Don't try to be too smart, don't hard sell, don't lie! Tip 3: ​Read the above link again and avoid terms like "potential" or making claims about how big the business can become in future. This is a major turn off for buyers - it says that your price expectation is based on some rosy future rather than what you're currently selling. Tip 4: Get an expert to put your copy together for you! Drop me a note if you want a recommendation. Expect to pay well for good copy! 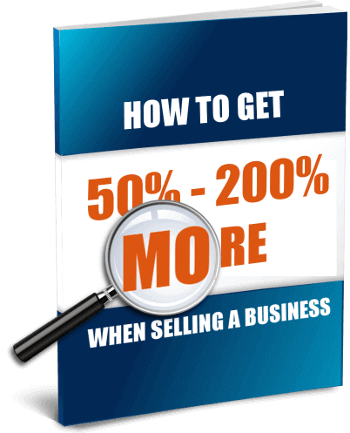 A couple of hundred pounds on good copy could get you tens of thousands of pounds more in the sale price (and, importantly, avoid alienating buyers). Update: ​The remaining tips have now been removed from here, sorry. But they will be eventually sent out to our newsletter subscribers. If you aren't a subscriber you can subscribe here for free.